Napa Valley, these days it's where tourists go when they want to experience "wine country". For those of us who've lived in SF awhile, you find yourself expanding to other areas with wineries and vineyards like Sonoma, Paso Robles and even Livermore (I know but look it up). Recently, the SO and I decided to get away for a few days and go old-school kitschy tourists and see what was up in Napa/St. Helena/Calistoga these and maybe hit up some populist wineries like Beringer and Sutter Home (ooo...pink zinfandel!). Besides some silly winery fun and drink it was also an opportunity to try some new eating places, though sadly no French Laundry as they are currently closed for a remodel, oh well. That still left plenty of other places to try, the first of which was a sort of revamped place. It was originally called French Blue, but new management has rechristened it Archetype and revamped the menu. They've had 8 months to work out the kinks so seemed like a good time to go. It's a pretty big space inside and the all white kind of feels nautical, but as the night comes on and the soft yellow lights twinkle it did make the bright white feel a little less harsh. The place is also packed and the noise does approach San Francisco restaurant levels, almost. It's a small focused menu with a handful of apps, entrees and sides. Things don't start off so swimmingly as once the water was brought it took time before a server appeared and took our order. So much so, I almost flagged someone down. The time did at least give us plenty of opportunity to dissect the menu and have our choices ready. First app is hearts of peach palm with red beets, blood orange, hazelnuts and orach. I love a good beet but me and the SO thought this was all a bit one gelatinous note. Sure there were some nut bits but they didn't really add anything to this dish that really needed some kind of flavor. For as colorful as this looked, taste wise it didn't match up. I was almost tempted to add some salt to enliven it up, probably should have. 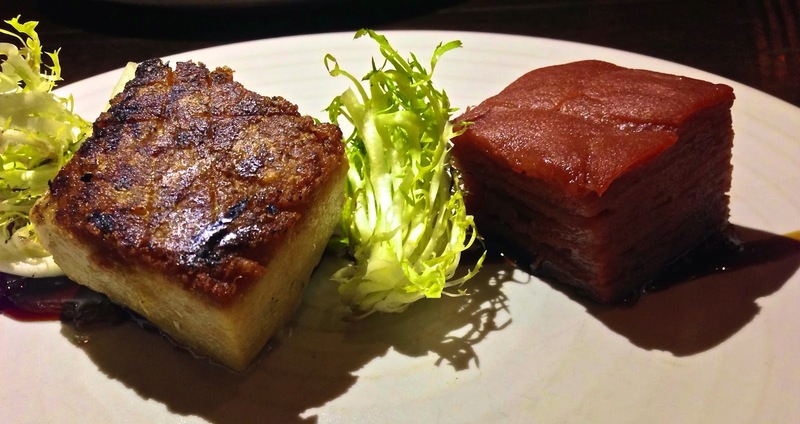 Ah, pork belly, if it's on a menu, I'm gonna order it. It also came with some charred frisee, soy caramel and a quince brick. The belly had a nice crunch top layer but sadly the rest was a bit overcooked as it came off on the dry side and difficult to pull apart. The quince brick was interesting, sort of like a pear meets an apple then baked like a cobbler without crust, sugar or any other tasty things. It was a little tangy sweet and I'm guessing the frisee was there to offset that. Of course I see belly and frisee paired up a lot for some reason, I think it's the crunchy versus supposed to be soft belly, which didn't happen this time. The one thing on the plate both me and the SO actually enjoyed was the soy caramel. A salty sweet smear that did add some flavor to the dry pork. After the appetizers were served I'm guessing something went down in the kitchen as the entrees were delayed, meaning more than 20 minutes from one course to the next. Fortunately for us we were having some lovely conversation with the older couple beside us who seemed to have eaten at every 3 and 4 star restaurant in the Bay Area, totally jealous. We were also treated to a holdover app courtesy of the kitchen. House made tater tots with French onion dipping sauce. An upscale take on a white trash delight to be sure and we both loved it. Instead of bits of potato the tots were made with strings of potato, served hot and crunchy on outside, soft and starchy inside. The dip was a 70's dinner party flashback that was well exacted and had the flavor I remember. A very yummy side dish. 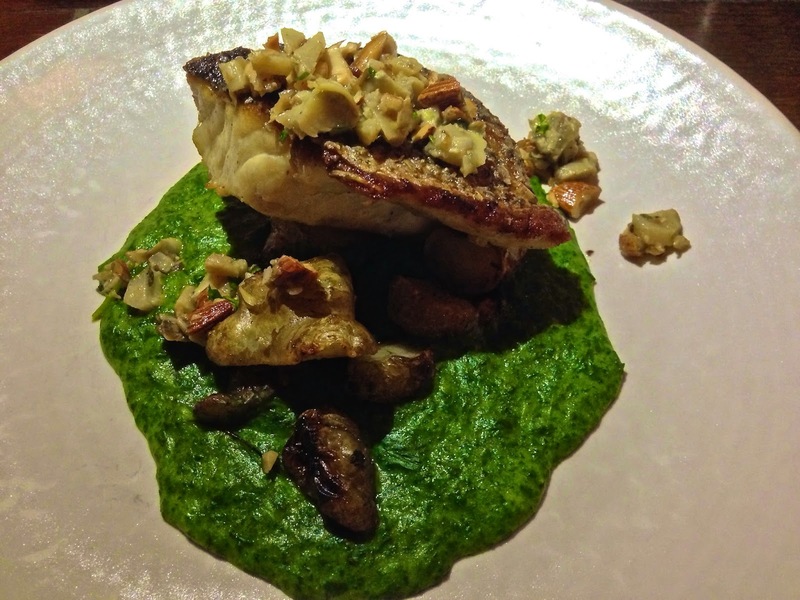 I got the pan roasted striped bass with creamed savoy spinach and roasted artichokes, almonds and sunchokes. I could tell and you can see in the picture that the spinach has a skin on top of it which form my restaurant experience means this plate sat under the heat lamps for a bit, most likely while our other entree was being prepared. Sadly, this did not do this dish any favors. The bass was over cooked and tasted fishy--something folks tell a shouldn't happen The skin on top was so crispy it was hard and difficult to cut. Instead of being flaky and buttery it was overly firm and bland. The spinach also lacked seasoning. Neither of us were big fans of this dish. I did like the sunchokes though. 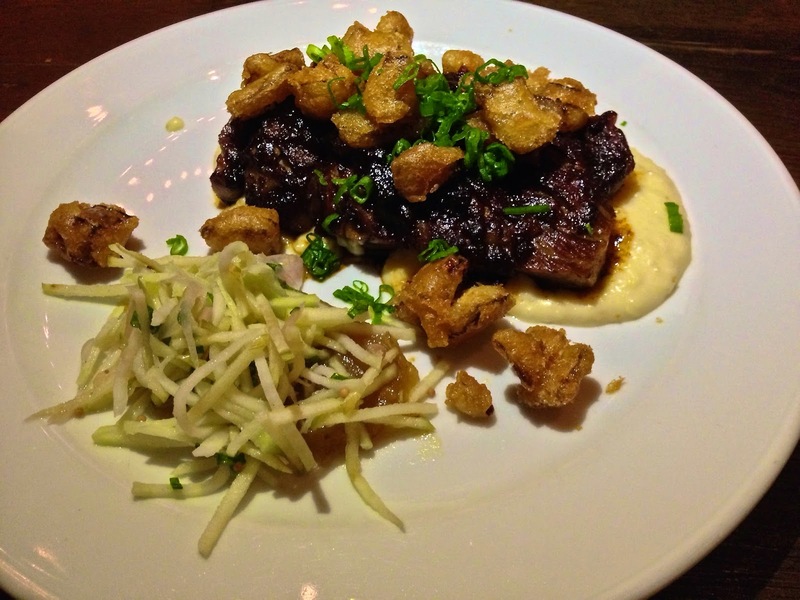 Our other selection was boneless baby back ribs with Anson mill grits, Gravenstein apple butter and kohlrabi dry mustard slaw and fried onions. For the most part this dish was much better. I like the idea of boneless ribs. It was a juicy, tender chunk of pork with a tangy not too sweet barbecue sauce. The grits were a little on the thin and creamy side for me, they were closer to polenta than real Southern grits. The slaw was an interesting take with the addition of apple butter, probably could have used some more spicy kick to trade on the sweetness, but it had a good crunch and paired well with the ribs. The fried onions I really wanted to like but their were like crunchy salt bombs--I guess that's where all the seasoning from some of the other dishes went. Overall a so-so dish with a winner of a protein at least. We did get a side dish to try that I though sounded interesting. 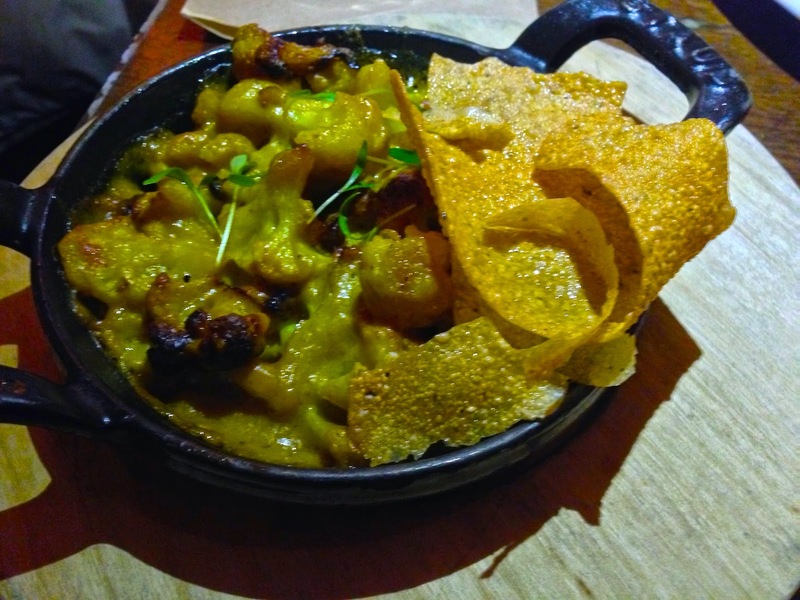 Curried cauliflower gratin with chickpeas and a house made cracker chip. I will say this tasted exactly as described and for whatever reason, something in the taste was off to me and I didn't like it as much as I thought I would. However, the SO really liked it a lot and thought the mix of curry and cheese was a winner. It just goes to show no two taste buds are alike and sometimes you never know what is gonna work for ya'. After we finished out dishes, the plates sat for another space of time before being cleared away. I'm not sure what was going on back of house but it sure rippled down through the front of house service even after the restaurant began to thin out. But you know, I always think a meal can be saved by some fabulous dessert and when we finally got the dessert menu I did narrow in on 2 of the 5 choices they had. Yet, lo and behold, my restaurant curse reared it's ugly head and they were out of the two things I had zeroed in on. Something that might have been nice to know when the menus were presented. I would say I was torn about this place, but an uneven dining experience is what it is, kitchen issues or not. Under seasoned and over cooked food really is a no-no wherever you eat. I kind of want to say the same about running out of stuff, particularly when it comes to dessert. Maybe had I gotten just a plate of the boneless ribs and tater tots (that's a great pairing) with slaw I might sing a different tune, but I didn't and therefore I'm not. Archetype is too much on the expensive side to try again for me when you also add in the service issues. I don't think having more wine would have really helped either. (Point of note--we had drunk A LOT that day at tastings so just skipped it at dinner) Then running out of two desserts really was the last straw for me. We don't come up to Napa often so not eating here again won't be a problem. Of course, now I'm really jonesing for dessert and I think finding a Happy Donut nearby really will be a problem. I am very glad to know about ARCHETYPE RESTAURANT. Well, I am fond of having poke and I loved this poke dish. Yesterday, I tried “Asta restaurant” menu and it was great. You know, it is one of the best Boston restaurants. You must visit this restaurant once.